The Leadership Embodiment Coach Training Programme (LECT) deepens your experience of the practices and principles of the LE model. 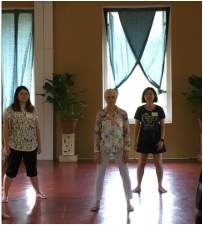 Founder Wendy Palmer and Tiphani Palmer, teach LECT in Asia, over 6 months, offering you the concepts, language and structure of how we share the LE model with individuals and groups. The LE model is based on our capacity to know ourselves and to share our potential for wise and compassionate action under pressure. Like any endeavour that is worthwhile, it takes commitment and effort to go beyond our personal challenges and extend ourselves. We reach into the LE community for support and training, and beyond - into the greater community of people we serve and are committed to empowering. Complete on its own as an embodied coaching model, LE serves as a somatic component alongside other coaching models. Participate in the evolutive lifelong research and practice that LE is, with Wendy and Tiphani Palmer, together with a dedicated community. We support growth internally – through meditation and personal practice, and externally – through leading and coaching individuals, groups and teams. LE Associates are graduates from LE Coach Training. LE Asia has a practice of ten LE Associates based in Asia. LECT is tailored to experienced professional coaches, facilitators, teachers, leaders and mentors, committed to their personal development. It is not intended as a coach training certification if you are new to coaching. Develop your embodiment of LE model's core competencies to more skillfully instruct/coach people or groups in the fundamental model of Leadership Embodiment. Be more powerful, clear and engaging as you share the principles of Centering and Recovering, using simple accessible language and delivery process of the LE model. Develop greater capacity to support the people and groups you serve for their quick recovery and sustainable learning, using the LE model's exercises within other models or modalities. The 6 month LECT programme consists of 3 modules. Each is 4 days long. Be assigned to a trainee practice group for the duration of the training. Practice groups will be expected to meet or Skype at least twice between modules. ​Trainees take on at least one practice coaching client for the program. Meditation is an integral part of the training, and trainees are asked to engage in a minimum of 15 minutes of meditation per day. Trainees will be asked to report on their meditation experiences or insights at the beginning of every module. Trainees receive a Training Binder that includes schedules, programme guidelines, and the Training Manual. Trainees are given access to a Teachers Community Portal online and are expected to log into and use that site for communication, reporting and discussion throughout the course. The portal is a continuing community resource. LECT is an intensive programme. We optimise learning with a small class size of 14-15 maximum. We ask that anytime any element of the LE model that is shared, be clearly attributed to LE. We do not ask for any % or payment when an associate delivers the LE model. Graduates are free to use the LE model as a stand-alone programme or take elements of the model and integrate them into an offering they may already have or they create (stating credit the LE model where appropriate). Graduates are NOT credited to train other facilitators in the LE model. *LECT graduates who are interested in teaching the LE Fundamentals (the prerequisite courses to LECT) will need additional training modules. Contact us for details here. ​ LECT awards ICF Continuing Coach Education Units as follows: 108.5 Total of which Core Competencies 71 and Resource Development 37.5. It is essential to complete each Leadership Embodiment Training - Level 1, Level 2 and Retreat, before you apply for LECT. Attendance is mandatory at all training sessions, no make-ups will be offered. Only in the case of a family or medical emergency, can accommodations be made. Mentoring and practice group sessions are NOT mandatory. Mentoring sessions may be held in person, by phone or through video-conference. Participating in the LECT has proven to be one of the most precious gifts I've ever received. Awakening a deeper connection to the intelligence of my body has expanded my capacity to wholeheartedly embrace and more skillfully respond to the mystery of life. The somatic imprint of centeredness is a way of being that I am energized to share with the world. LECT is helping me connect with my clients in a deeper way and do more meaningful work. Clients get it right away and find it extremely useful. The LECT is helping me create new distinctions that make my coaching more powerful. And, I get to interact with a wonderful community! As a coach for over 10 years, LECT has truly deepened my own practice and in turn allowed me to offer skillful somatic coaching to my clients.